In a small bowl, combine seasoning salt, garlic, parsley, onion powder and pepper. Sprinkle over roast to season. Turn Instant Pot to saute. When it reads "hot", add the oil and sear roast on all sides. To do this, place the roast in the pot and do not move for 2-3 minutes. When you flip it, it should release from the pan easily. 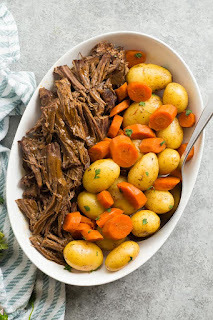 To the Instant Pot add broth, tomato paste, vinegar and Worcestershire sauce -- if there are brown bits stuck to the bottom from the meat, give them a scrape and they should release easily. Stir to combine. When the cook time is over, turn the Instant Pot off and let the pressure release naturally for 10 minutes before turning the valve to venting and opening the lid. Add the Little Potatoes and carrots, put the lid back on, turn the valve to sealing and select Manual or Pressure Cook for 3 minutes. When the cook time is over, let pressure release naturally for 10 minutes before moving the valve to venting, releasing remaining pressure and opening the lid. Remove beef from the Instant Pot and slice or pull as desired. Serve with potatoes and carrots. OPTIONAL: If desired, combine equal parts corn starch and water, stir into the remaining juices and turn the Instant Pot to saute. Whisk continuously until juices are thickened and serve with pot roast.